I consider myself fairly open to varied genres and expressions and tolerant enough to sit through any decent movie. So, I fail to understand why I never gave the Documentary its due attention and respect. And it is difficult to figure out further, how all of a sudden I find in myself a new fan of this genre. The technological basis of the art of the Documentary is not at all different from other expressions of cinema. Documentary too is cinema. And is an immensely powerful form of expression. I was late in realizing this; hopefully I’m not too late. During the last few days I had the fortune of watching three documentaries. One of those was Unmistaken Child, on the search for the reincarnation of Lama Konchog, a world-renowned Tibetan master. It was the only of the thirty-four films I saw at the Mumbai Film Fest that left me choked and teary-eyed. I could not believe in it entirely, but was still deeply affected. Then there was this great documentary on the life of Ayn Rand – A Sense of Life. A life as great and as inspiring as hers is an amazing story in itself, but even the craft of this film was exemplary. And finally, today, I saw An Inconvenient Truth- Al Gore’s revelation of the subdued crisis called Global Warming. As it progressed, believe me, I felt I was watching a Horror film, only with this realization that it won’t be over as the movie ends. This is the impact of documentaries. Since it is real, and the medium of cinema manages to communicate it in the most realistic way possible, each documentary, provided it is well-made, manages to affect you deep within. And it leaves you enriched. You just feel wiser, if not more. 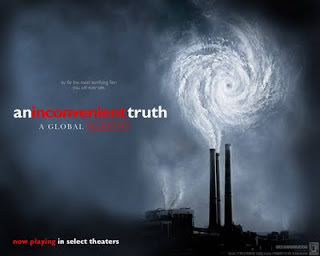 I would highly recommend An Inconvenient Truth to anyone who considers him or herself literate, cultured and/or sensible. Those who can, please take a copy from me. Or you can rent it from BigFlix. Others can download it from the net, and not feel guilty about it at all. Watch it. Re-watch it. And share it with as many as you can. Its poster reads: "By far the most terrifying film you will ever see."